If you have been following this blog at all this summer you know that I have reviewed everything that I have seen in theaters with the exception of Zack Braff’s Wish I Was Here that I will do soon. Wish I Was Here was by far the best movie I have seen in a long time and top five best of this summer. 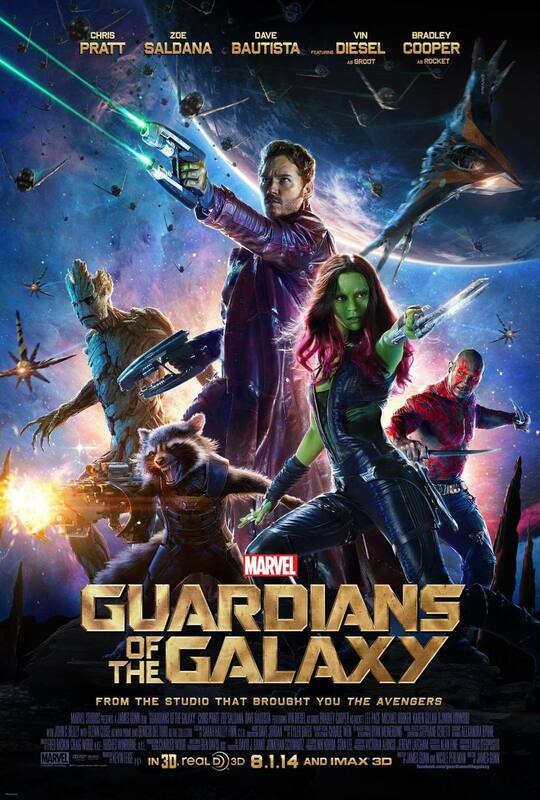 BUT..and a really big BUT..Guardians steals the show for a multitude of reasons. No, I have not read the comic but at this point in loving the whole entire Marvel universe it probably would be a good idea. Real fans of any story love the book and hold all the details of the characters in close scrutiny. The reason most people are disappointed with the movie version of a book or comic is usually because of the effort and the time you invest in the book..point is..its never the same. Plot Overview: Guardians flashes back to the capture of Peter Quill as a little kid in 1988 losing his mother and planning to live with his grandparents. He then gets taken up into the spaceship. Here we find him as an adult going through the Galaxy as Starlord. Ronan and Thanos are the evil Lords of the galaxies(I am sure the comic has more about that). Quill realizes the orb he has stolen to make some extra cash could potentially destroy the present universe he lives in. In all attempting to make better lives for themselves the Guardians all end up in a space prison together where Rocket the brilliant misfit of a fox helps get the crew out. 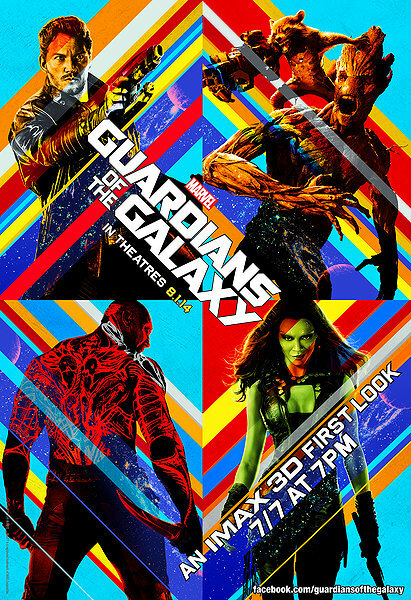 Drax, who is huge and full of revenge toward Ronan, Groot, Gamora, Rocket and Quill form the Guardians of the Galaxy. Full of non-stop humor, snappy one-liners, brilliant looking special affects and much action worthy fighting sequences lead me to put Guardians at the top of the list for Marvel’s Avengers. And knowing that after Winter Soldier and Guardians all is building up toward a much exciting Avengers 2. In the end the Guardians get their crimes erased for saving the world and go on to redeem their “loser like” lives by trying to do some good. Besides an awesome soundtrack there were many hilarious moments that( in the history of me seeing films in the theater) haven’t had to many laugh out loud moments. Peter’s reference to Kevin Bacon in Footloose was pretty awesome. Rocket trying to steal a guys fake leg and a dude’s eye is priceless and totally messed up. Drax not paying attention to the plan was actually very well crafted. Peter’s awe inspiring line: “life takes more than it gives, but today it is giving us something..a chance to give a crap!” Actually makes me believe that Chris Pratt can do both funny and serious and not to mention getting totally ripped for the role. When Peter does the dance off for Ronan to “ooh child things are gonna get easier” and Ronan says, “what are you doing?” Peter says, “I am distracting you, you terd blossom!” One of the best moments of the film. When Peter asks the Nova headquarters for help and relays the message he says, “We believe we are total butheads but not one hundred percent..( a word not worth, ahh..repeating) but you just had to be there for that line. When Drax ask if he could rip a guy’s spine out if he gets mad at that person..Rhomann says that would be murder..the worst crime of all!..priceless. In conclusion, good can come from the most unlikely of sources. Heroes have the choice to do good or bad and through bad and through being deemed “unlikely” or even called a “loser”. That is what we love and that speaks louder to average people who can feel very bored and not very awesome. So, see it and laugh and buy the soundtrack.